PITTSBURGH–(BUSINESS WIRE)–PPG (NYSE:PPG) today announced the completion of a COLORFUL COMMUNITIES™ project in Pittsburgh, Pennsylvania, that helped revitalize Propel Homestead charter school. The Colorful Communities program provides PPG volunteers and paint products along with financial contributions to bring color and vitality to communities where the company operates around the world, such as in Pittsburgh, PPG’s global headquarters city. The project brought together nearly 110 employee volunteers from the global PPG research and development (R&D) community who spent the day revitalizing 21 classrooms and eight bathrooms throughout the school. PPG provided approximately 110 gallons of PPG PAINTS™ products for the project. Propel Homestead opened in 2003 with 180 students in the basement of the previous Homestead hospital. It was the first school for Propel Schools, which is a not-for-profit federation of public charter schools in educationally underserved communities. Today, Propel Homestead has approximately 400 students in kindergarten through eighth grade and operates in a renovated school facility. The PPG volunteers painted classrooms in the school’s colors of blue and yellow to create a brighter learning environment for the students and faculty upon their return from summer vacation and for years to come. PPG Paints colors used included Spun Cotton, Honey Bee and Windjammer. PPG volunteers previously completed Colorful Communities projects at Propel Hazelwood in 2015 and Propel Pitcairn in 2016. 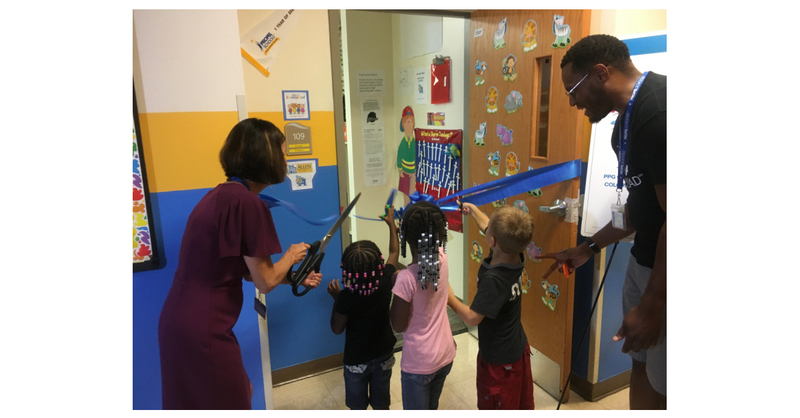 Faculty and students of Propel Homestead participated in a special unveiling ceremony during the school’s annual back-to-school block party to celebrate the newly restored classrooms for the 2018-2019 school year. A number of PPG scientists participated in the event by offering interactive science demonstrations for those in attendance. We protect and beautify the world, Colorful Communities and PPG Paints are trademarks and the PPG Logo is a registered trademark of PPG Industries Ohio, Inc.